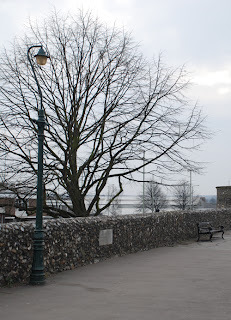 Canterbury has been here since the Iron Age when the first settlers arrived. Later it when the Romans conquered Britain they built several buildings in the town and in the 3rd Century they also built a wall around the city. As time passed the wall was destroyed, fixed, ruined, fixed again and now you can take a walk along the wall. In a sunny day it is one of the nicest places to walk in Canterbury. Today wasn't sunny but I went up there and took some photos for you.